Built into a scenic bluff overlooking the Missouri River, the Lewis and Clark National Historic Trail Interpretive Center contains exhibits detailing the 1804-1806 Lewis and Clark Expedition officially known as the Corps of Discovery. The centerpiece of the self-guided exhibit hall is the two-story diorama of the portage of the Great Falls of the Missouri River. It is the ultimate source of information on the area's importance in the Lewis and Clark story. The center helps visitors capture the feel of the historic journey along the Missouri River. The interpretive center chronicles the journey of Lewis and Clark and their encounters with and dependence on Native Americans for help. It also details the discoveries from plant and animal life to the impossibility of a Northwest Passage water route made by the Corps of Discovery. Self-guided tours through the center bring history to life with displays in chronological order of the expedition's 8,000-mile journey from St. Charles, Missouri, to the Pacific Ocean and back. 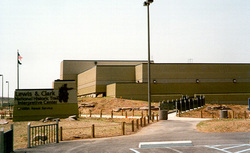 The $6 million center is operated by the US Forest Service. Trails linking the Interpretive Center to The River's Edge Trail, Region 4 Headquarters of Montana Fish, Wildlife & Parks, and Giant Springs State Park. The Center is a great place for interactive learning! If you are interested in bringing your school group, please contact the Education Coordinator at (406) 727-8733. Admission: $5 adults, $4 students/seniors (Golden Age Passes accepted); $2 youth (guided programs may cost more); FREE for kids ages 5 and under. Group rates may be available. For $3, a visitor can rent a headset and a handheld digital device loaded with a 30-minute basic exhibit tour in English, Spanish, French, German, and Japanese. A visitor with more understanding of the Lewis and Clark story has the option of hearing 45 minutes of actors portraying William Clark and George Shannon reminiscing 20 years after the expedition concluded - available in English only. Directions: The Lewis and Clark National Historic Trail Interpretive Center can be reached by following the brown Interpretive Center / State Park signs in Great Falls. 1/4 mile from Giant Springs; 1.5 miles east of Black Eagle Dam.